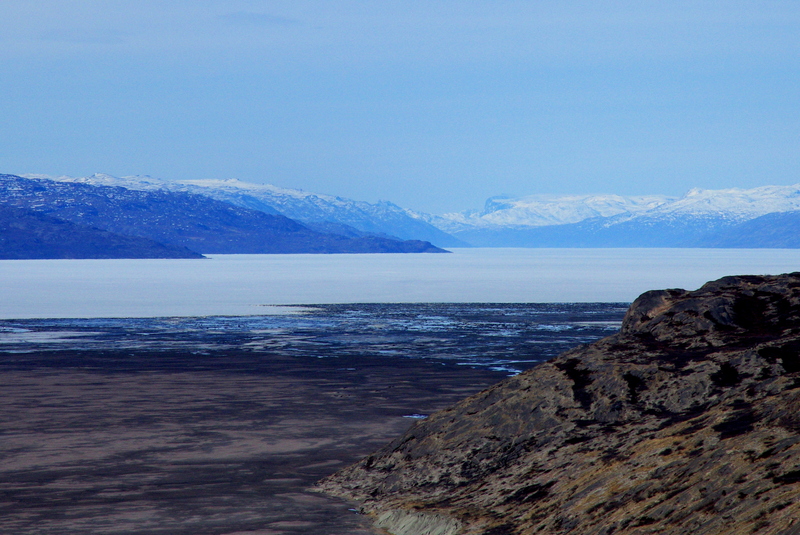 We arrived in Kangerlussuaq, Greenland three days ago, flying into a brown landscape that is patched with snow. The weather feels like a hot-apple-cider autumn. Best of all, the mosquitoes are still dormant on the edges of frozen ponds. 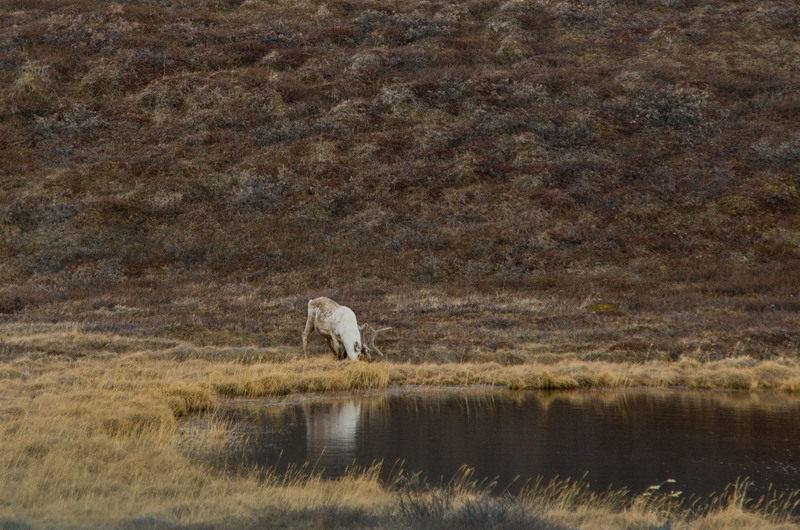 The coats of the caribou are light tan and white right now. I think they are transitioning over to their summer coats. Kangerlussuaq Fjord covered in ice. Bare willow (Salix glauca) branches with last year’s catkins. My awesome research assistant at the top of Sugerloaf. The fjord is in the distance. 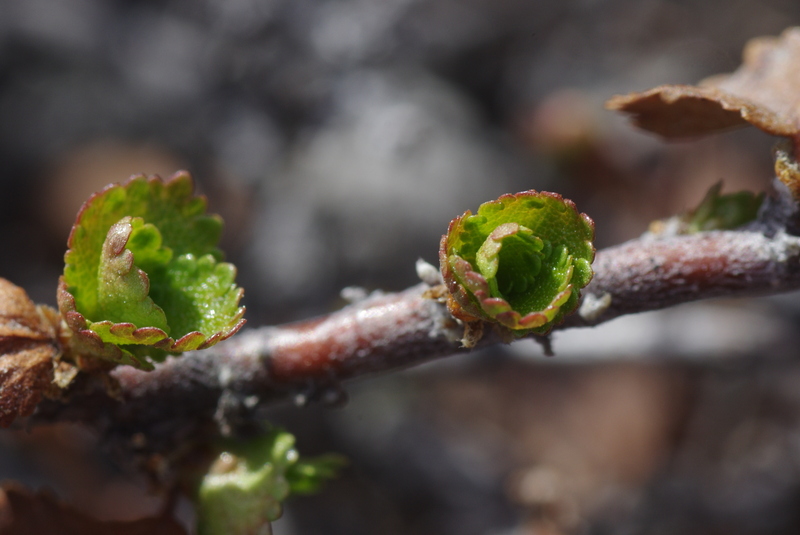 Yesterday I saw green dwarf birch (Betula nana) leaves starting to unfurl. Things around here are about to change drastically. By the time this blog is posted, we’ll be somewhere over the Southern Ocean, heading toward Christchurch, New Zealand. We’ve had an incredible month here in Antarctica, and it’s been wonderful to share our experiences with you all. Here’s one final blog answering more questions from the students in Windsor, VT. Many thanks to the students who asked such great questions – you have made us think about our experiences from new perspectives. We can’t wait to meet you sometime this spring! How are Antarctica’s Dry Valleys desert similar and different to warm climate deserts here in the US? It can be surprising to learn that Antarctica is a huge desert, since warm deserts (like in the Southwest US) tend to come first to people’s minds. Although the two landscapes may look very different, there are actually a lot of similarities. 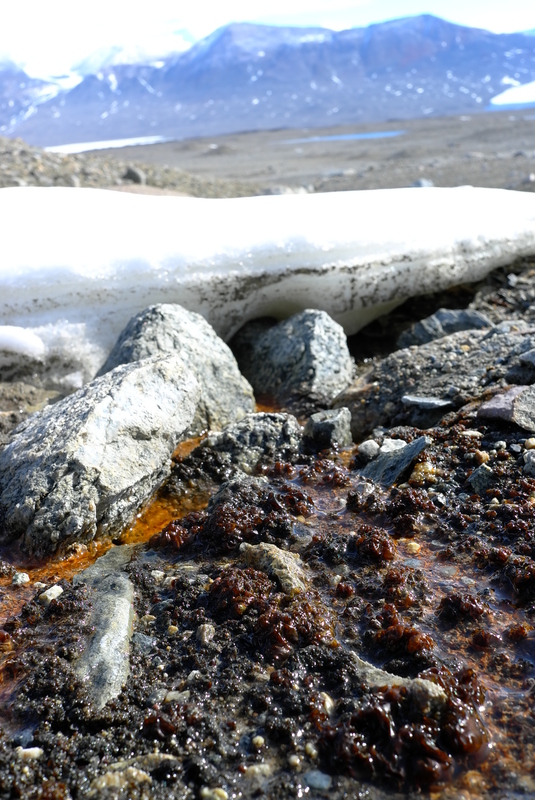 For instance, think about the organisms that survive in these harsh environments. Desert organisms need to be able to cope with long periods of time with no liquid water, and they need to immediately take advantage of the water when it returns. In both warm and cold climates, organisms deal with this challenge in similar ways by entering a state called cryptobiosis, which allows them to live indefinitely when conditions are unfavorable. Cryptobiosis is an adaptation that allows organisms in both cold and warm deserts to survive. 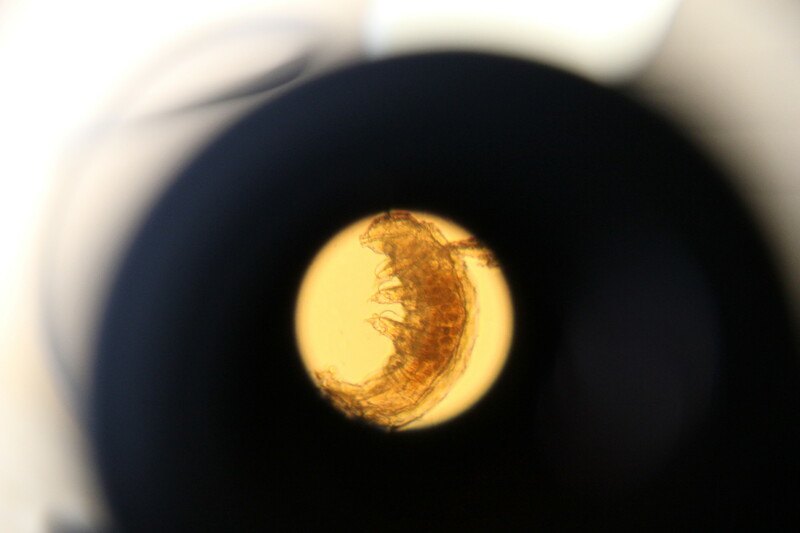 Tardigrades, or water bears, seen here through a microscope, are experts at entering cryptobiosis. Of course, there are many differences between the Dry Valleys and the Southwestern US. One big difference has to do with where liquid water comes from. 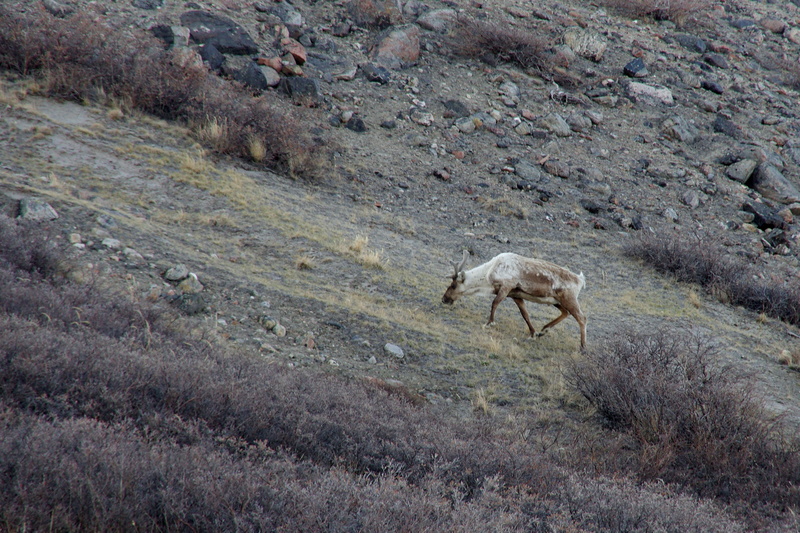 In the Dry Valleys, the majority of the liquid water running through streams comes from glacier melt during the warm summer months, which is not the case in the Southwest. What do you think might happen to the Dry Valley landscape as the climate warms? 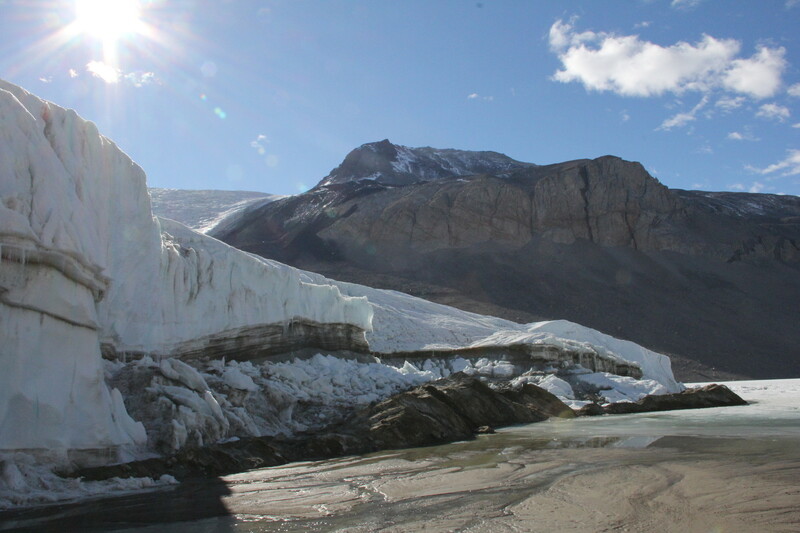 The majority of the liquid water in the Dry Valleys comes from melting glaciers. Here, Taylor Glacier drips in the beaming sun. Is the Commonwealth Glacier, or any glacier different from an ice sheet? What is the thinnest depth of the 1+ mile thick ice sheet? Yes, glaciers are different from ice sheets! Mostly, it’s a matter of scale. Ice sheets are enormous. There is so much ice that at the top of an ice sheet, all you can see in any direction is a flat white expanse. At the center of an ice sheet, the underlying land surface – the mountains and valleys that would be exposed if there were no ice – doesn’t influence the direction of ice flow. Ice flows out in all directions from the thickest point of the ice sheet, regardless of what’s beneath it. At the edges of an ice sheet, however, there can be areas that are very thin, and mountains can even poke up through the ice. 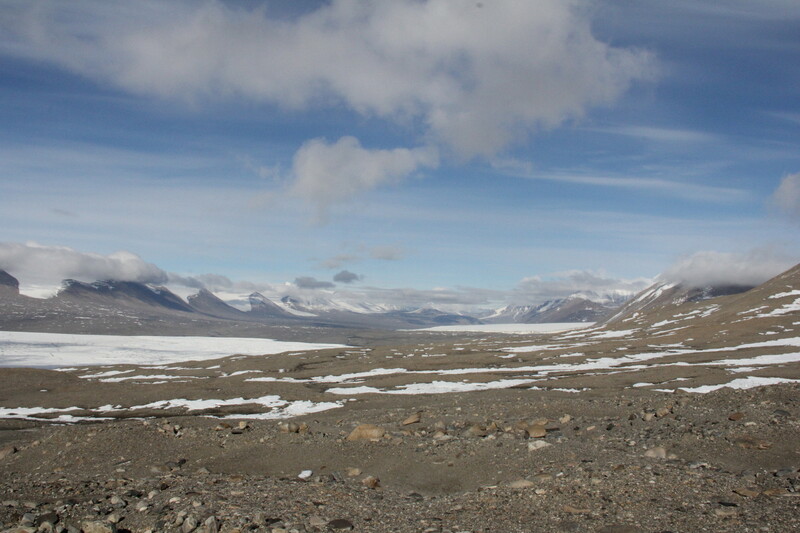 Although the Taylor Glaciers flows out of a huge ice sheet, it is a valley glacier, since it is confined to the valley between towering mountains. Valley glaciers, like the Commonwealth Glacier, are much smaller than ice sheets. Valley glaciers, as the name implies, are confined to the space between two mountains, so the local topography is very important in determining where the ice flows. The Commonwealth Glacier is a beautiful example of a valley glacier – it’s narrow between two mountains, and then expands as it reaches the floor of Taylor Valley. In the photo with your tent, how far away is your tent from the Commonwealth Glacier? Also, how far are you from the mountain in the background? Our tents at F6 Camp are about 1.5 miles away from the Commonwealth Glacier, if we were to take the shortest route. The camp is about 7 to 8 miles away from the tallest mountains you can see in the photo. In order to answer your questions, I had to measure the distances on a map. 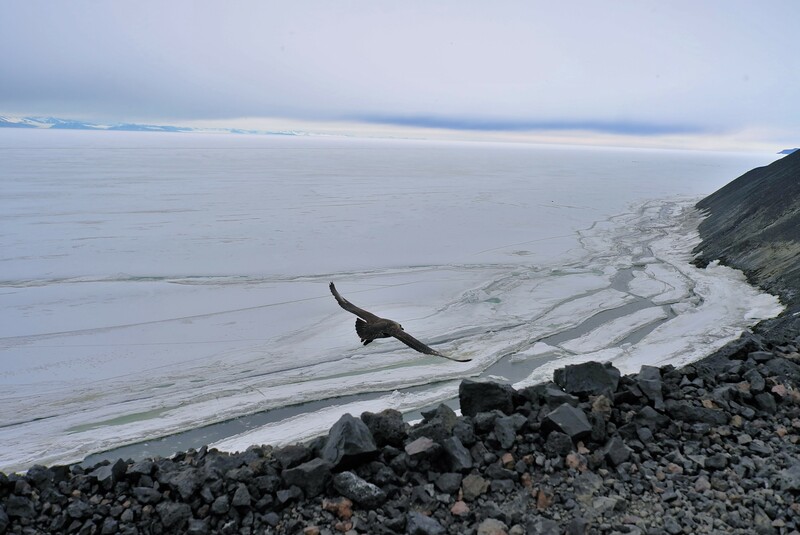 Scale is really hard to judge in Antarctica. With no trees or buildings, it’s almost impossible to tell how far away something is. Distances and elevations can be very deceiving in Antarctica. 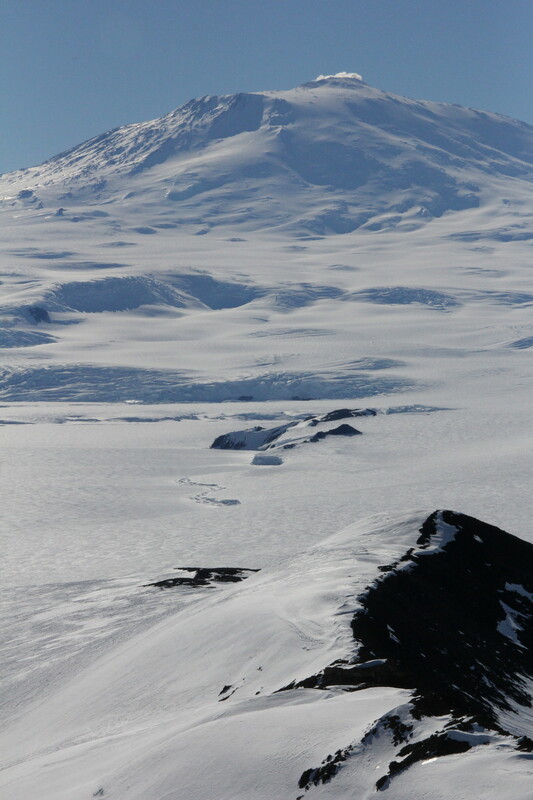 Mount Erebus, the southernmost active volcano, seems so close to McMurdo. In reality, it’s almost 30 miles away and is 12,500 feet tall! I would never guess that by looking at this photo! Do you take water samples along with soil samples? Do you take soil samples under water? Great questions! 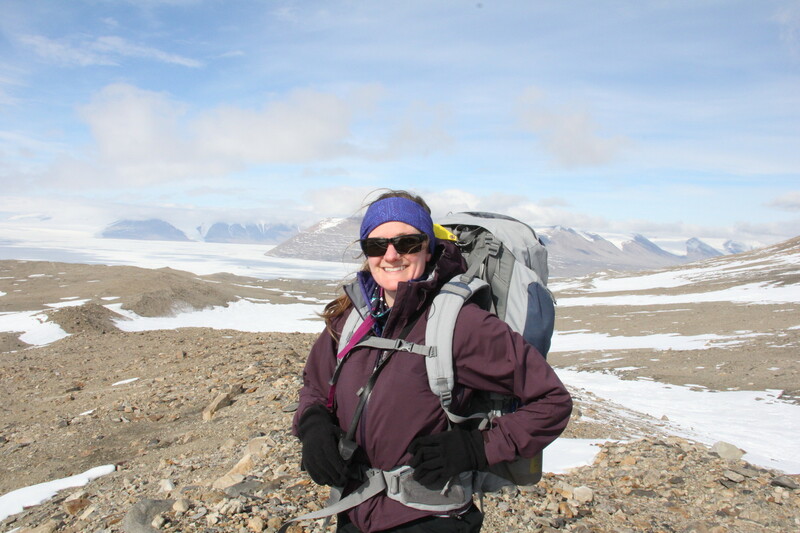 Although I’m focused on collecting soil samples, Jess and many other scientists working in the Dry Valleys collect water samples from streams, ponds, and lakes. They analyze these samples to see what organisms live in the water and to determine the nutrients and other chemicals in the water. So yes, we definitely collect water samples. 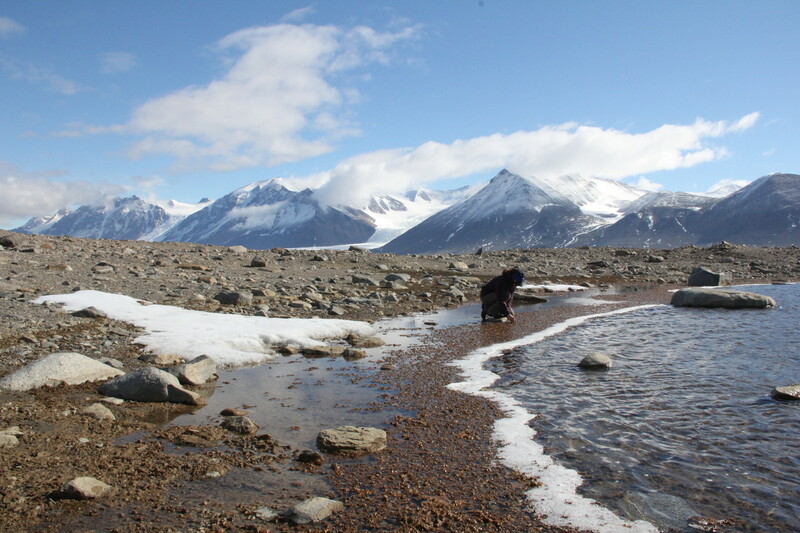 Jess collects water samples from one of the many ponds in Taylor Valley. We also collect samples of soils from within the streams. 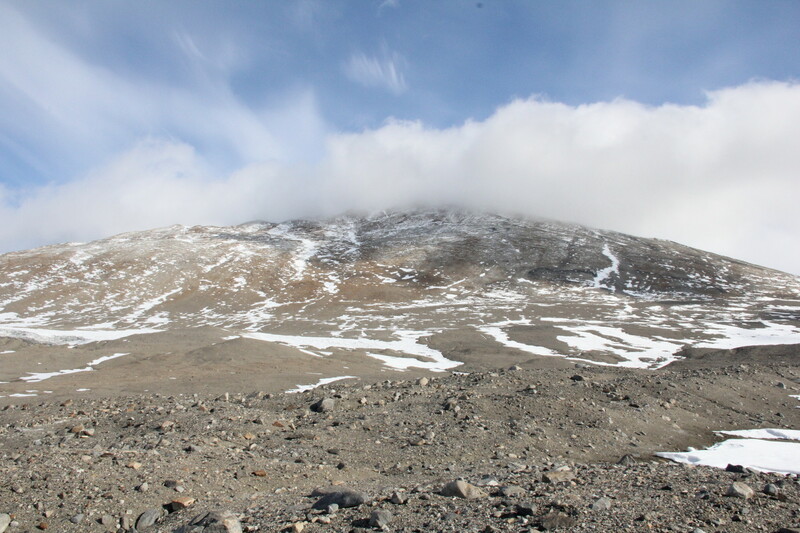 The majority of the soils in the Dry Valleys are very dry, located far away from any body of water. The wet soils near the streams, however, can be very different from the dry soils elsewhere. For instance, we find one particular species of nematode (microscopic worms) that really likes the wet soil, while another species prefers the drier habitats. 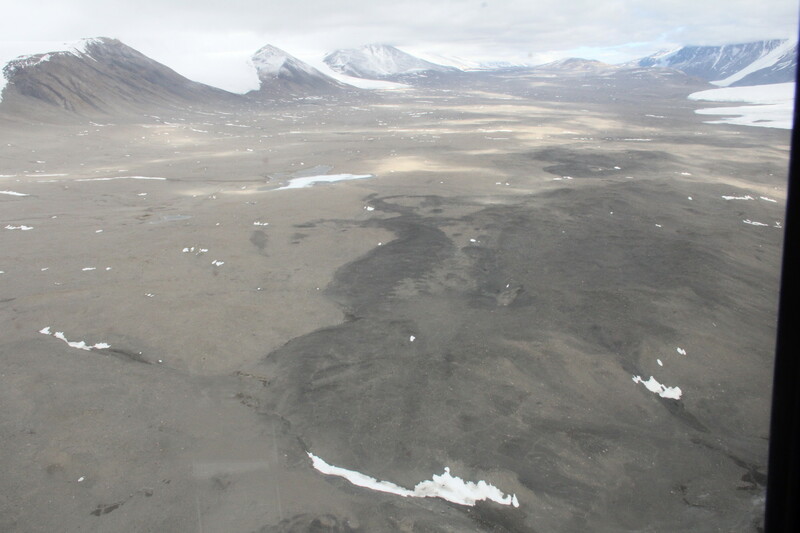 Finally, other scientists have also collected sediment from beneath the lakes of the Dry Valleys. These lake sediments are really cool because they can be really old, allowing us to determine what the lake was like hundreds and thousands of years ago. Do you need tools to get across wide streams or do you have a plan B? Having a plan B is always a good idea in Antarctica, where things never go quite according to plan. However, we have easily been able to cross the streams this season in just our hiking boots, since most of the streams are very shallow. A more difficult water crossing is getting onto the lake ice from the shore, across the moat that develops every summer. To get across the moat, people use ladders, planks of wood, and sometimes boats. Just in case, we always carry lots of extra layers, so that we can quickly get dry if we do get wet. During the summer months, a moat forms between the shore and the lake ice. Scientists crossing the moat to get out onto the lake ice will definitely want to have a Plan B! Do you get to access a helicopter whenever you need it & what type of helicopter is it? 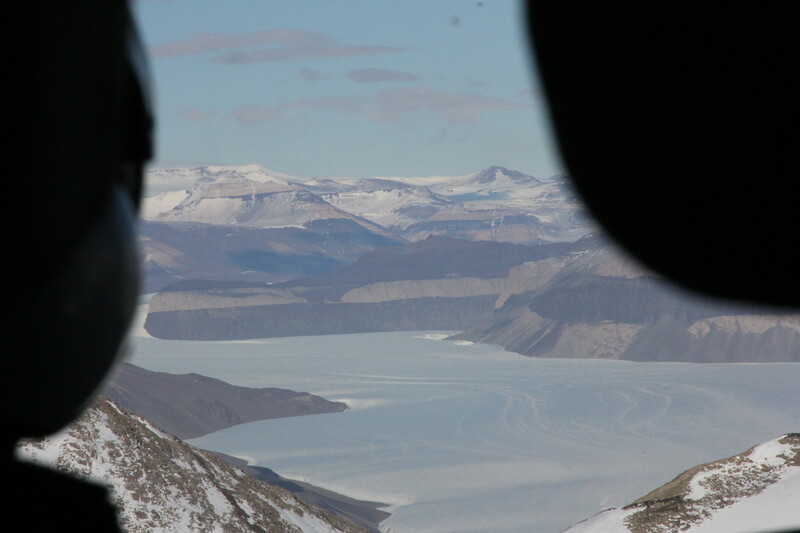 Flying in helicopters is one of our favorite aspects of working in the Dry Valleys. It’s absolutely spectacular to see the mountains and glaciers from the air. We’re incredibly lucky to have access to helicopter support – without it we wouldn’t be able to do our work. We share access to the helicopters with a lot of other people, so there are a lot of steps we have to go through before the helicopter can take us to where we want to go. Three days before we want to travel, we have to fill out a helicopter request form, saying where we want to go, and how long we want to be there. If all goes well, the night before we travel, we’ll get the helicopter schedule, telling us when we’ll be flying and which helicopter we’ll be on. Of course, as with everything in Antarctica, the schedule can quickly change due to weather, mechanical issues, or something else unexpected. 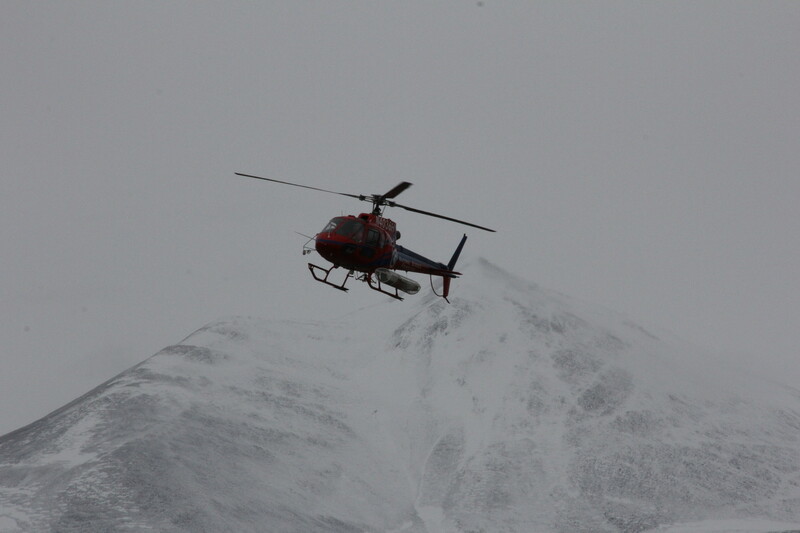 An AStar approaches F6 Camp after a few days of snowy weather prevented all helicopter travel in the valley. There are two types of helicopters down here, and we’ve flown in both. The bigger helicopter is a Bell-212, which can seat the pilot, the helicopter tech, and 8 passengers in the back. The Bell-212 can carry a lot of weight compared to the smaller helicopter, the AStar. The AStar can fit the pilot and usually just three to four passengers. Both are fun to fly in, but it’s definitely exciting to be in the front seat of the AStar because the windows go down around your feet and the views are incredible. 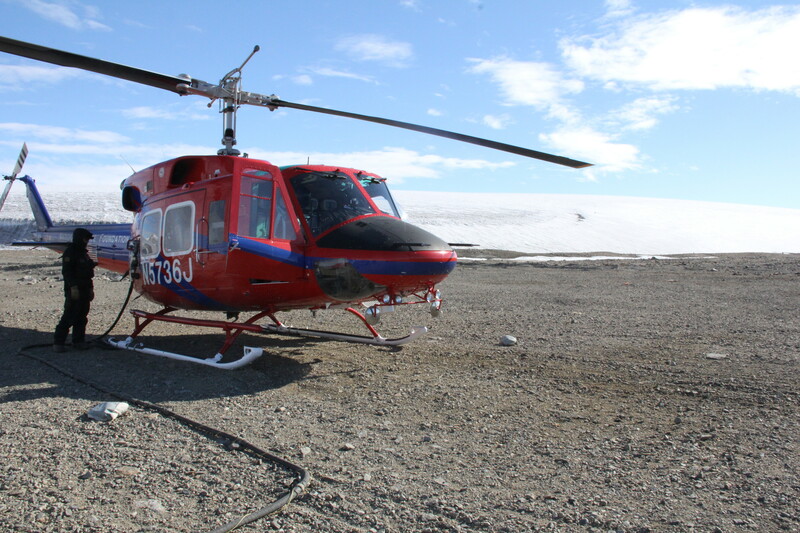 A Bell-212 is refueled before taking off to take us back to McMurdo. Many thanks again to all the students for asking such interesting and thoughtful questions! **Special Edition** Middle School Antarctic Q & A: Part 2! Thanks to the inquisitive minds of Windsor VT middle school students, we’ve received a whole new supply of Antarctic questions! 1. What does “avoiding skuas training” look like? Well, unfortunately it probably sounds way more exciting than it actually was! We didn’t get to practice dodging flying objects, nor did we take turns role-playing an angry Skua (although someone should probably suggest these things for next year). Instead, Skua-avoidance was just discussed as part of our “general safety training”, where they basically told us that these birds will attack if they get the sense you are carrying food. So to avoid giving them that sense, we have to make sure we don’t waltz out of the cafeteria so preoccupied with stuffing cookies in our mouths that we’re oblivious to the giant hungry gull soaring towards our heads. (Yes, we’ve actually witnessed this). Skuas seem to really enjoy taking people by surprise, so our best defense is keeping food hidden and one eye to the sky. Slightly disappointed that he couldn’t steal our food, this Skua flies off to scrounge elsewhere. 2. Do certain colors mean different things about the plants, such as dying or living? Great question. Even though it’s a cold dry desert, we see lots of colorful life out here…but most of it is pretty small in size and close to the ground or water. There are no shrubs, trees, leafy or flowering plants, but there are lots of species of mosses, lichens, algae, and bacteria that thrive in these harsh conditions. And these are the types of organisms creating the colorful patches we see near ponds and stream-beds. It’s pretty tricky to tell which are alive or dead because each type has a different set of pigments that give it that unique color. Sometimes these colors can be a little counter-intuitive – where we live in the Northeastern US, we usually see brown, black or orange leaves that die and fall off the tree each fall. But out here there are species that regularly grow with those colors! 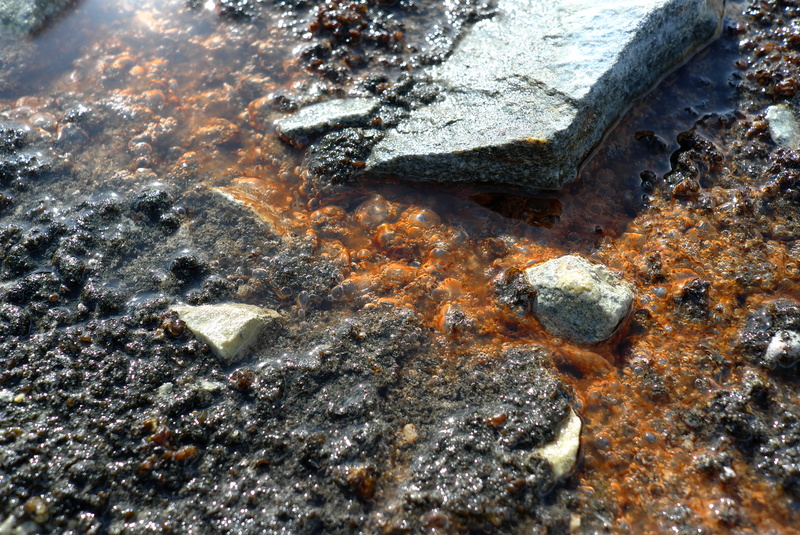 We see bright orange microbial mats that line the bottom of streams and ponds like a thick carpet. There are dark black leafy mats that look like crusty dead matter, but are actually alive. 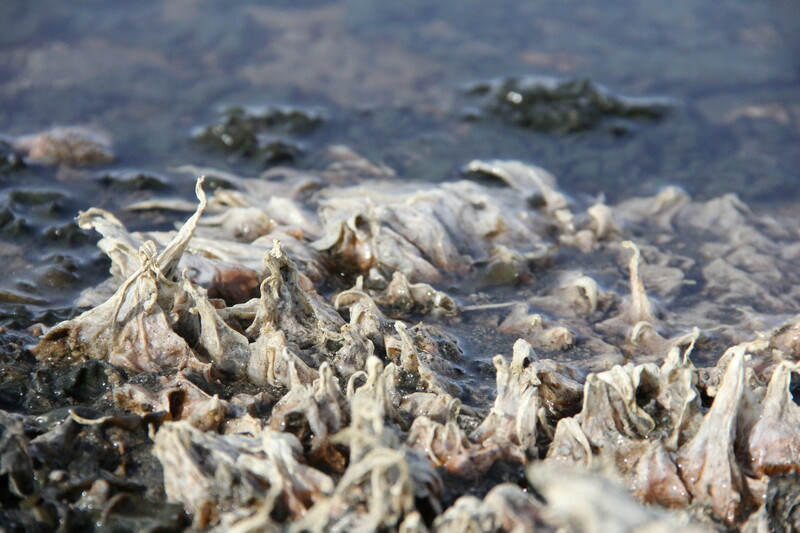 Some of these organisms grow in very shallow water which makes them extra exposed to sunlight and UV-radiation. This can damaging to them, just like it is to us. So to combat this they make special pigments that act as sunscreen, protecting them from the constant bright light of summer months. And sometimes even the dried and shriveled-up material at the side of streams are actually specially adapted to survive total dryness, so they may come back to life in the presence of water! 3. Do different color plants (besides green) have chlorophyll? This is actually one of the reasons microbial mats are so unique and interesting! The mats we mentioned earlier are built like a sandwich with multiple layers, and each layer contains different kinds of bacteria and pigments. 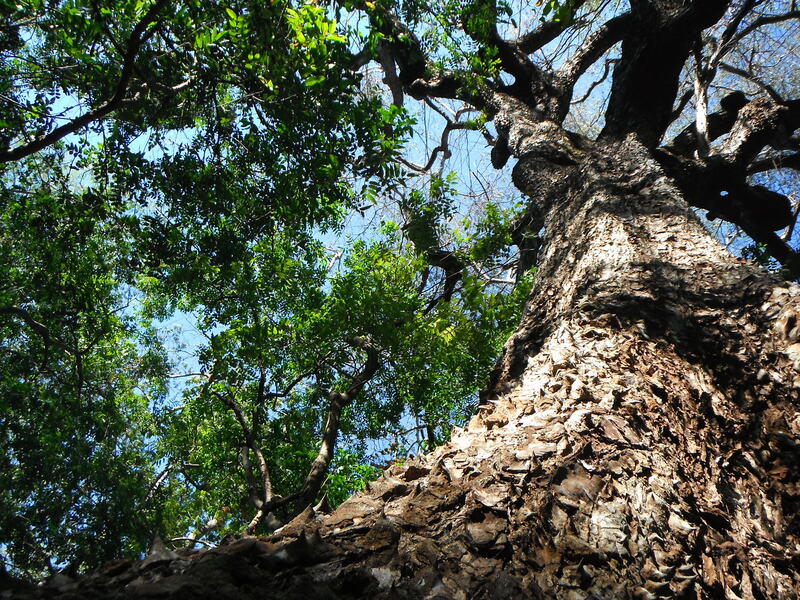 These allow them to maximize their growth even when conditions in the environment change – for example, mats often have protective sunscreen pigments on the top layer (where they’re more exposed to solar radiation), and chlorophyll or other pigments tucked away in the lower layers (more protected from harmful UV radiation). So often when you flip over a bright orange mat, you may actually see bits of green underneath. In fact, some bacteria will actually move up and down within the mat, which may be a way for them to escape intense solar radiation during certain times of year. 4. How is it able to get sunlight through the ice? And do plants in Antarctica have special adaptations to help them grow? Yes, ice can definitely reduce the amount of light entering the water. 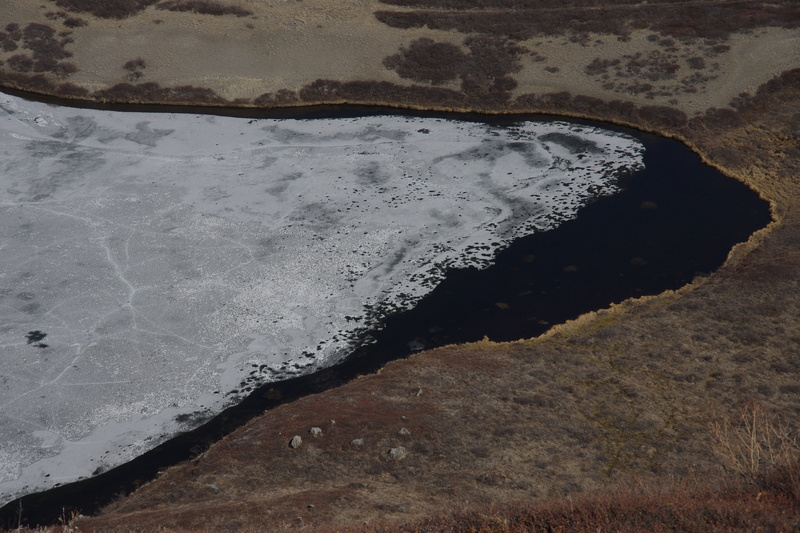 If the ice is thin and clear and the water is shallow enough, organisms with specialized light gathering pigments can still absorb enough to perform photosynthesis. But anything living underwater in Antarctica has to deal with drastic extremes in light (from total darkness in winter and under ice, to ultra high light in shallow ponds in summer). Plus, many water bodies are frozen all the way to the bottom in the winter, freezing these complex underwater structures in place. So to deal with these challenges they have lots of special strategies, such as producing cold-shock and anti-freeze proteins that protect them when the water around them freezes, or using specialized pigments that work extra-efficiently under low-light conditions. 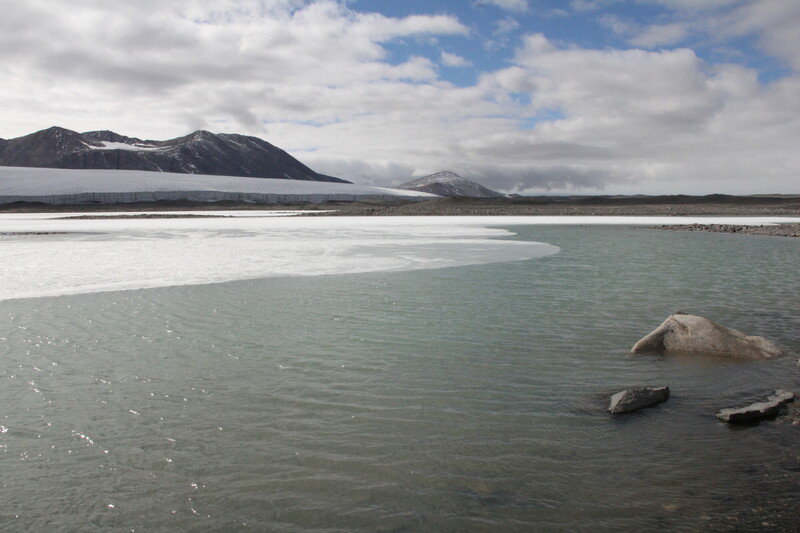 Here at the end of the glacier sits Lake Bonney, which is frozen even on this bright summer day. 5. What is the reason why microbes have certain colors? The color of microbes is due to the different colored substances inside the cells. Each substance absorbs and reflects different wavelengths of light, and we see the colors reflected. Chlorophyll reflects green light and absorbs the other colors, giving plants their green color. 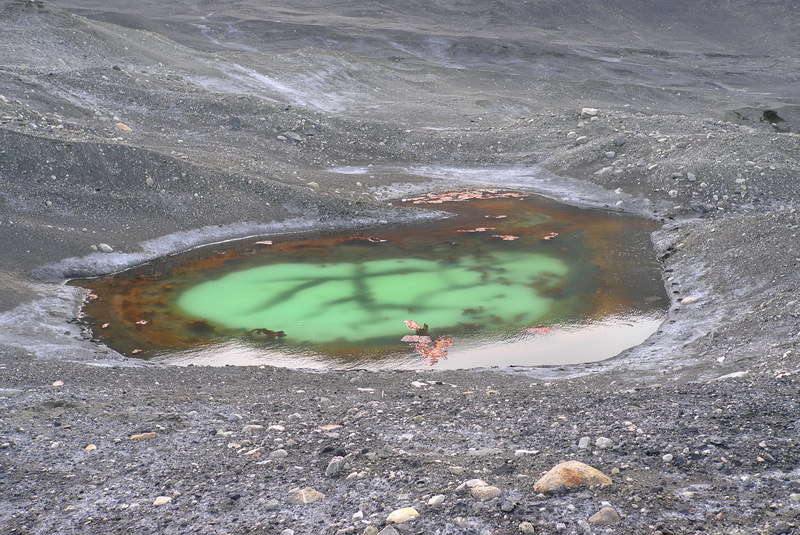 Cyanobacteria are unique because they perform photosynthesis much like plants. These bacteria got their name because they have special pigment called “phycocyanin”, and this gives them that blueish-green color. But bacteria also use pigments for functions other than photosynthesis, like protection against UV or antioxidant activity. 6. Do micro organisms affect the color of the streams? Good question –actually any bits of material in the water can affect the stream color as they absorb and reflect light. 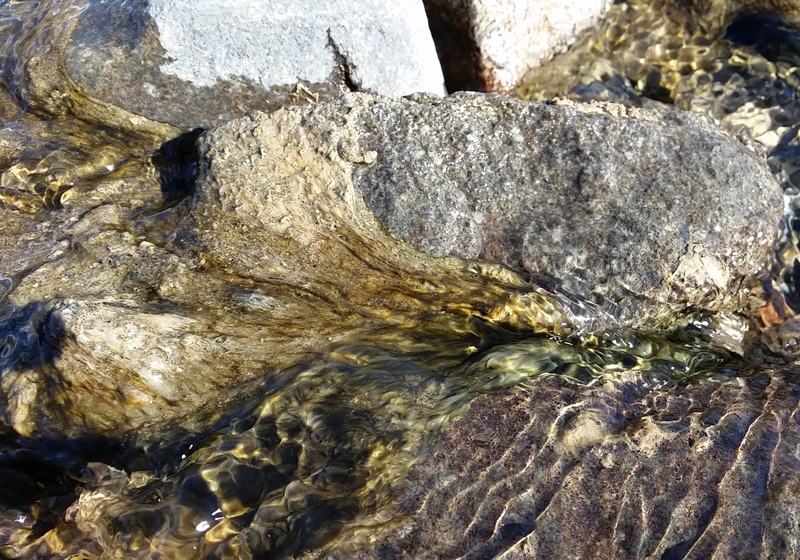 Often when large amounts of bacteria are healthy and growing they can cause water to look brown or green, although this happens a little less in streams where the water is constantly moving. But in lakes and ponds during the summer this can be dramatic – have you ever seen the water turn green in lakes near you? 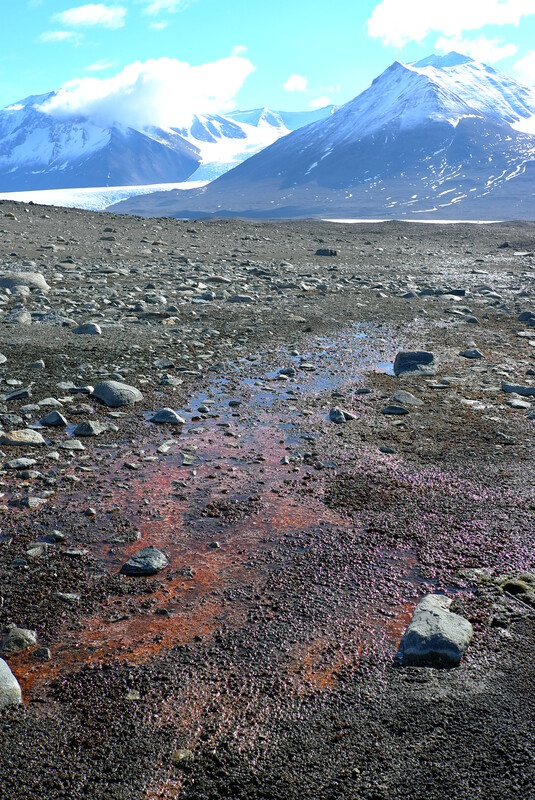 Because the water is very cold and often nutrient-poor, streams and lakes in Antarctica tend to be pretty clear water. But if you look at the bottoms of water bodies down it’s a different story – that’s where all the colorful mats and microbes hang out. Long filaments wave like green strands of hair in the shallow water of this Antarctic stream. 7. Why do the microbial leaf mats look like rocks? Mats come in a wide range of shapes, colors, and sizes. I think some resemble leaves, others definitely look like rocks, there are flat mats that cover the sediment like a big shag carpet, and there are strange tubes that grow vertically like underwater towers. It’s not clear exactly why each of these has such a unique shape and growth pattern, but most likely they all position themselves in a way that maximizes their ability to do things like absorb nutrients and light in their environment. The result is pretty elaborate! Then, just under the surface of that same pond you get a new perspective – thick mats completely take over, covering the sediments, growing in all dimensions, and creating an underwater microbial city. 8. Do you need a special camera to take underwater pictures? Yes! I use a GoPro with a waterproof case to take underwater footage. 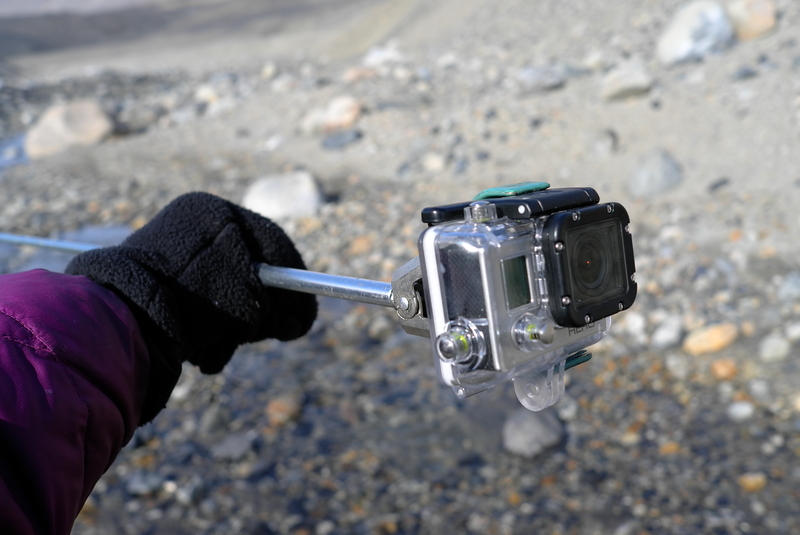 And since the water is very cold, I try to mount the camera onto a long rod so that my whole arm doesn’t go numb in the process! 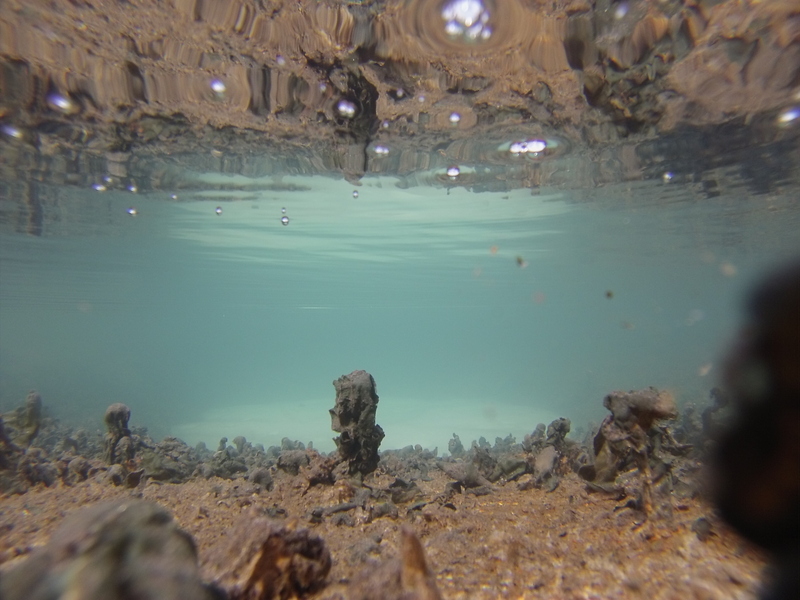 The GoPro allows me to snap some shots of the underwater life in ponds and streams. Thanks again to all the excellent questions & stay tuned for Part 3! This post was originally featured on the Dartmouth Biological Sciences Foreign Study Program blog. We’re not in Greenland anymore. That thought has been passing my mind on a daily basis since I arrived in Costa Rica to do biological research in the tropics as part of Dartmouth’s foreign study program. For six weeks, we’ll be going across the country, jumping from field station to field station as we conduct scientific research from the planning stage to the final paper. Having focused my research on the Arctic up until this point, I was both excited and curious to start my coursework. 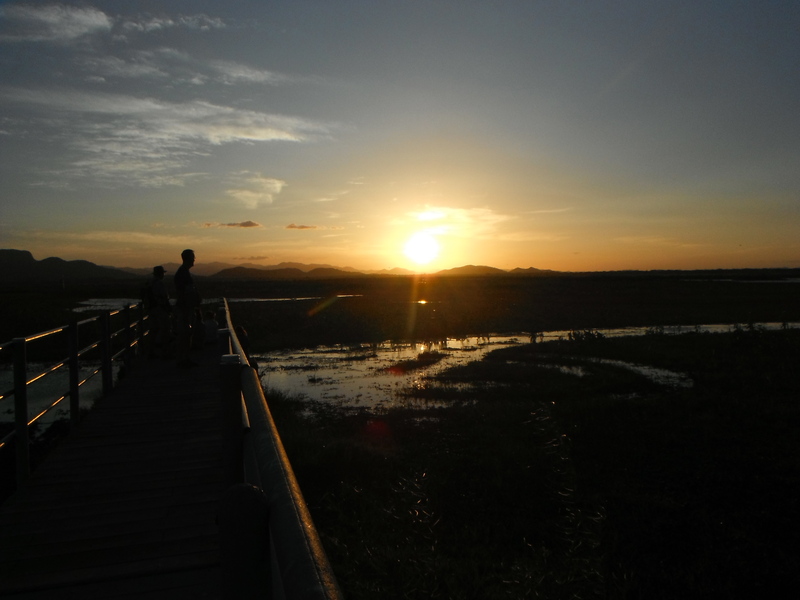 The minute we got off the bus at our first station – the Palo Verde National Park – I immediately felt a wall of intense heat smack me in the face. This was an experience unnatural enough to be having in January, but do be doing research in anything but chill weather seemed alien to me. And here I am in Costa Rica, measuring soil moisture in the same way I analyzed our Greenlandic samples back in Hanover! Both regions are significantly affected by climactic changes. Arctic and tropical ecosystems are some of the most vulnerable to tipping points and thresholds, wherein global warming may cause irreversible changes to our environment. Interestingly, though, I haven’t heard talk of either region among both communities of researchers. I still have so much to learn about these regions and others around the world, all of whom contribute to a better understanding of climate change. (Stay tuned for more reflections as the weeks pass by!) As a budding climate scientist, I recognize how important it is to acknowledge that our world is deeply interconnected – from the poles to the equator. And I’m incredibly grateful to have had the opportunity to conduct research in these places, hoping to gain the skills that will form my work as a scientist, understanding the world’s collective future. In previous blogs, I’ve hinted at the goals of my research, but have left a lot of questions unanswered. Why study phosphorus cycling in the first place? Where does this phosphorus come from? 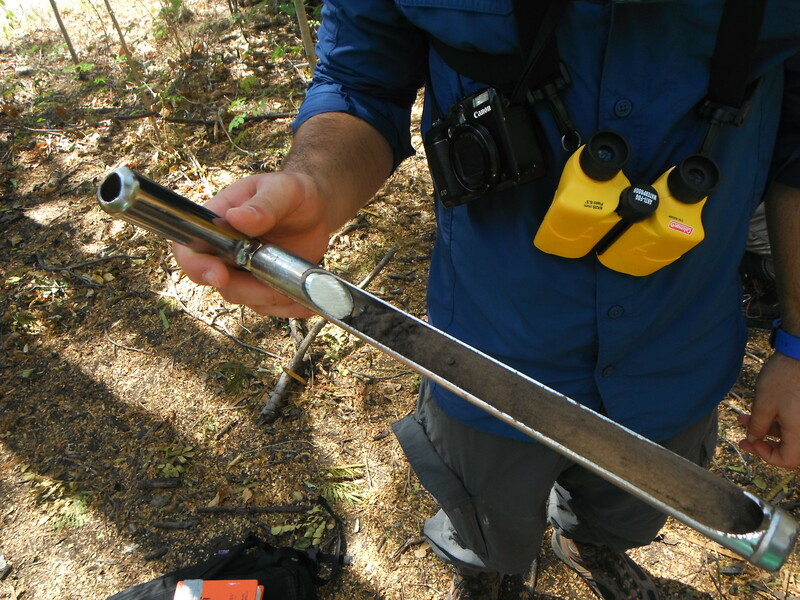 What guides my soil sampling when I’m in the field? I’ll try to answer many of these questions below, but please post if you’re still wondering! One of my many sampling sites in Garwood Valley. Why did I pick this spot? What am I looking for when deciding where to sample? All life on Earth (that we know of) depends on phosphorus and other essential nutrients. Even life in the Dry Valleys, adapted to extreme conditions and limited resources, couldn’t survive without it. Everywhere on Earth, the available phosphorus organisms can use ultimately comes from igneous rocks. Getting the phosphorus out of those igneous rocks (where it’s mostly locked up in a mineral called apatite) and into the ecosystem is a long process. Soil scientists are interested in understanding how quickly new phosphorus can enter the system. As you might expect, there are a lot of factors at play: the amount of apatite in the igneous rock, the speed at which that rock can break apart physically and chemically, the presence or absence of organisms that might help in dissolving the apatite…and we could go on. 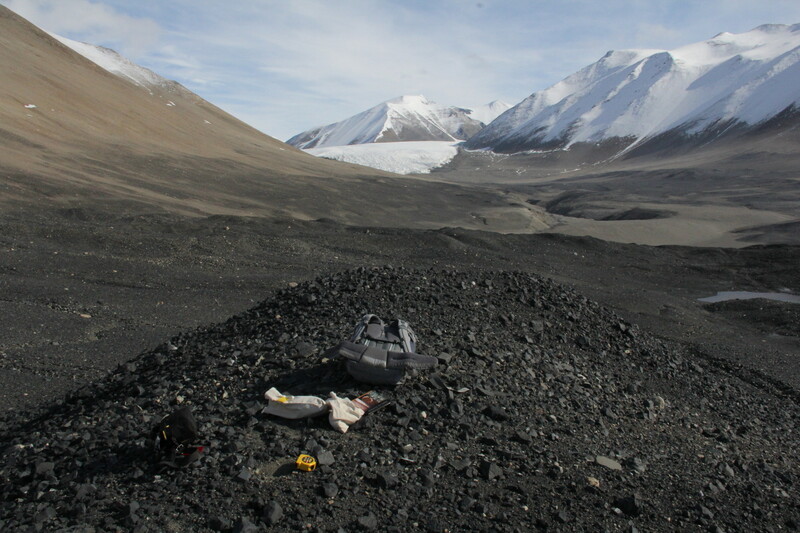 In the Dry Valleys, we are in a unique position to answer questions about phosphorus cycling because of the relative simplicity of the ecosystem and some interesting differences in parent material (or type of igneous rock) and landscape age. Let’s consider parent material first. 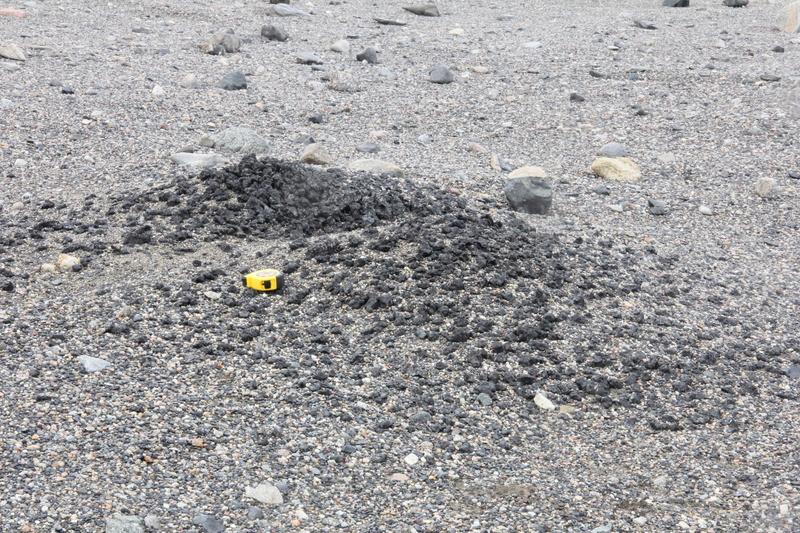 Here on Ross Island (where McMurdo Station is located), we are close to the source of some extremely unusual volcanic rocks, including kenyte. Not only is kenyte very distinct in its appearance, but it is also distinct in its composition, containing way more apatite (and thus more phosphorus) than other igneous rocks. 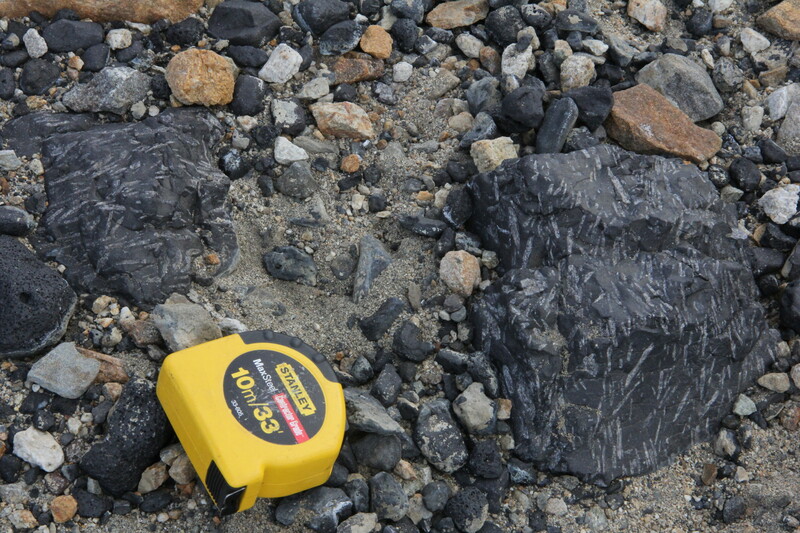 Two pieces of kenyte, the most distinctive rock of the Dry Valleys. These days, my eyes are trained to pick out this dark rock from far away. It’s always exciting to spot one! 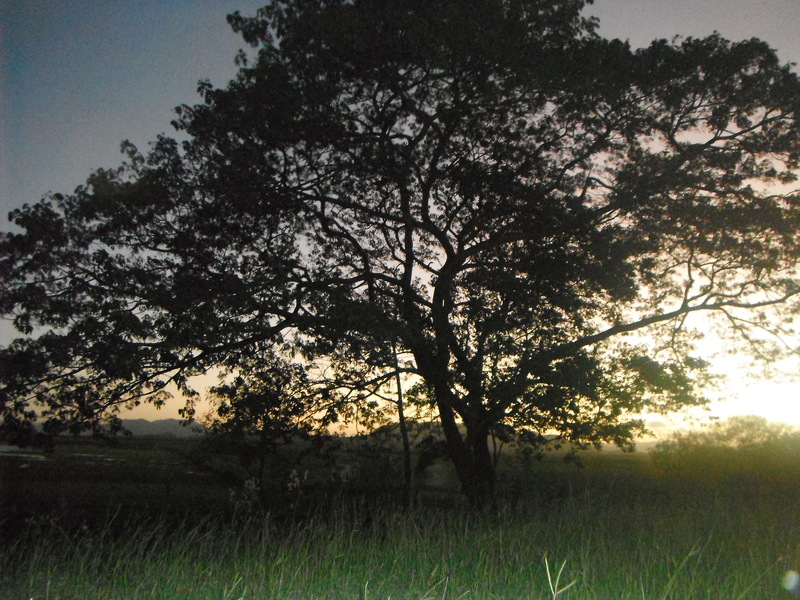 Although the source of kenyte is Mt. Erebus and other nearby volcanoes, past glacial activity has scattered kenyte (and other phosphorus-rich volcanic rocks) all over the Dry Valleys in very interesting patterns. Since there is no vegetation, and kenyte is a very dark rock, these patterns are clearly visible both on the ground and from the air. Dark soils containing lots of kenyte are noticeable in Taylor, Garwood, and Miers Valleys, just to name a few. In Taylor Valley, patterns of dark kenyte-rich soil are clearly visible from a helicopter. Do these dark soils contain lots of phosphorus that organisms can use? Or is all that phosphorus still locked up in the rocks, unavailable to life? This season, I’m trying to answer these questions by collecting samples from the dark kenyte-rich soils to compare their phosphorus content with the amount found in the lighter kenyte-poor soils. A large disintegrated boulder of kenyte. Does the soil under this rock contain more available phosphorus than the soil away from the rock? But parent material isn’t the only factor that could influence phosphorus availability. The more time a soil has to develop, the more time phosphorus has to be carried away by water or wind, or taken up by an organism. Older landscapes generally have less total phosphorus than younger landscapes. Or what about the organisms living in the soils? Some microorganisms will excrete enzymes that help to break down apatite, releasing phosphorus into the ecosystem in a form that they can use. What if there are more of these organisms in one soil compared to another? This season I’m also trying to address some of these other factors. I’m collecting samples on landscapes of different ages to look at the influence of time on phosphorus availability. And I’m collecting samples for a colleague who will take a look at the apatite-dissolving enzymes in the soils to consider the influence of organisms on phosphorus availability. 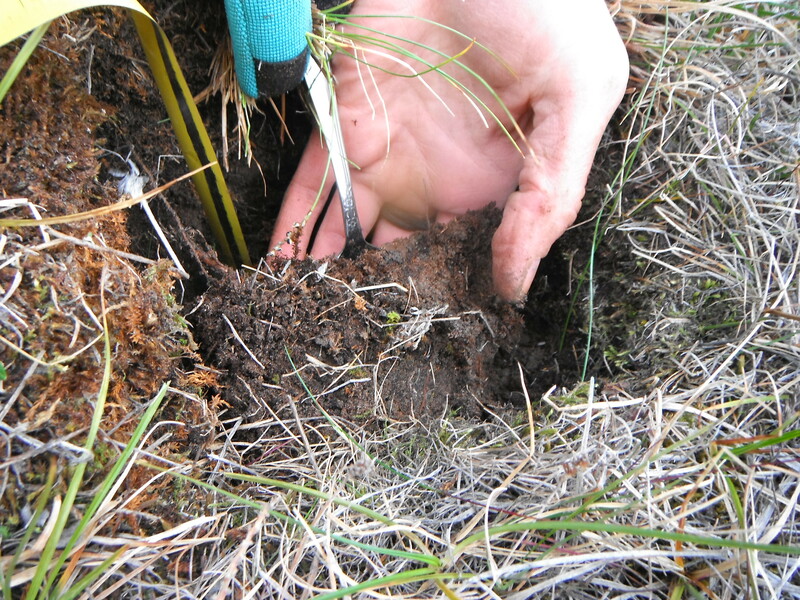 The area around Hjorth Hill gave me the opportunity to sample soils of different ages. 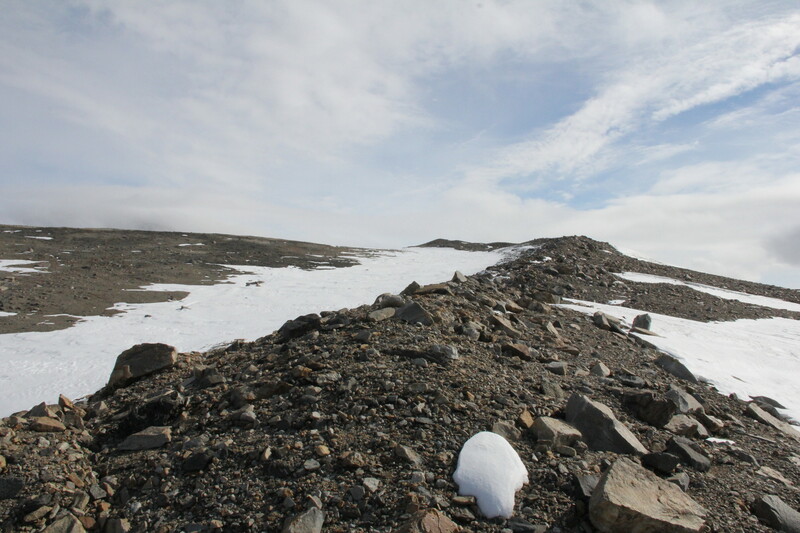 Soils higher up on Hjorth Hill are thought to be much older than the soil in the foreground. 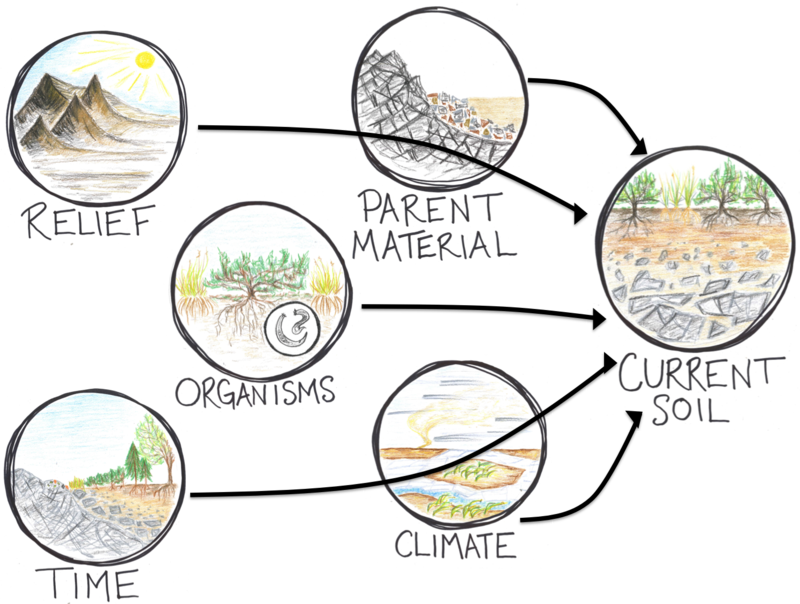 Even in a relatively simple ecosystem like the Dry Valleys, teasing apart all of these soil forming factors is extremely complicated. 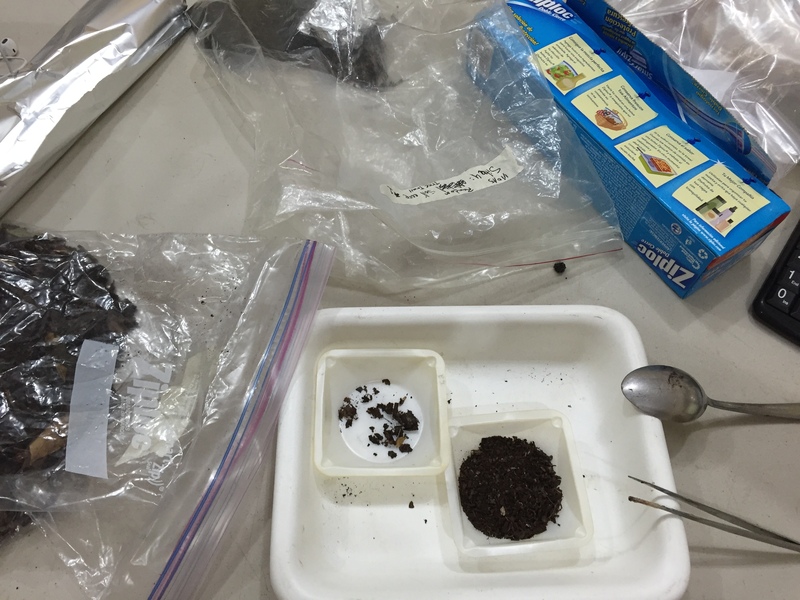 While I don’t expect to solve every riddle this season, I am hoping that the boxes of samples I’ve collected so far will contain some clues into phosphorus cycling in the Dry Valleys! 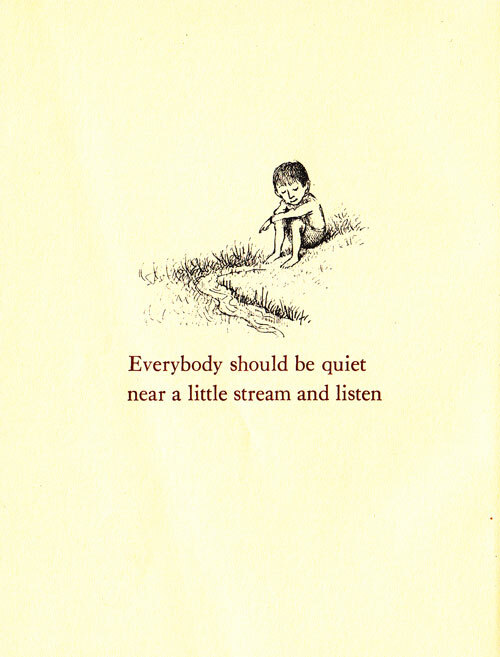 Whether or not they intended to, perhaps the beloved Kraus and Sendak offered important scientific advice. Ground-time in the field, particularly when logistics involve helicopters transport and unpredictable weather, is truly precious. We fill pages of notebooks in anticipation of our field work– detailed schedules, lists of goals, back-up plans. Then we step off the helicopter and the proverbial timer starts. We have 1 week, or maybe 5 days, or often 4 hours to make all those plans happen. Whatever the case, it’s difficult to escape the urgent pressure to make every second count. But one of many gifts in working with a partner in the field is that we may remind each other to stop for a moment, and dedicate some time to quietly observing our incredible surroundings. In this spirit, Ruth and I designated our first task to becoming “acquainted” with the valley. Ruth sits perched on a hilltop in the center of the expansive valley, taking it all in. Vibrant mats appear along streams, even a shallow trickle such as this one. As we walk around, one of the most prominent features is the myriad of twisting little streams. Some are audible if you are very quiet, though often the wind drowns that out. We stumbled across tiny ones, requiring me to squint inches away to even tell it was moving, and others that were wide enough we were unable to cross. From the helicopter they are hardly visible. Yet they create an extensive network of interconnecting waterways, like arteries, weaving in and out of ponds and feeding vital resources to a desert landscape. As we get close, colors and textures began to stand out. Along the stream edges, colorful mats, and sometimes even moss patches, grow in thick clumps. It seems strange at first- finding red, green, and orange life forms in a desert like this. But as water penetrates the ground underneath the stream bed (called the ‘hyporheic zone’), a damp area is formed adjacent to the stream. This allows for things like algae, cyanobacteria, and microbes to be active in these wetted areas. In this way, water bodies can be extremely influential on where, when, and what types of organisms thrive in the valley. 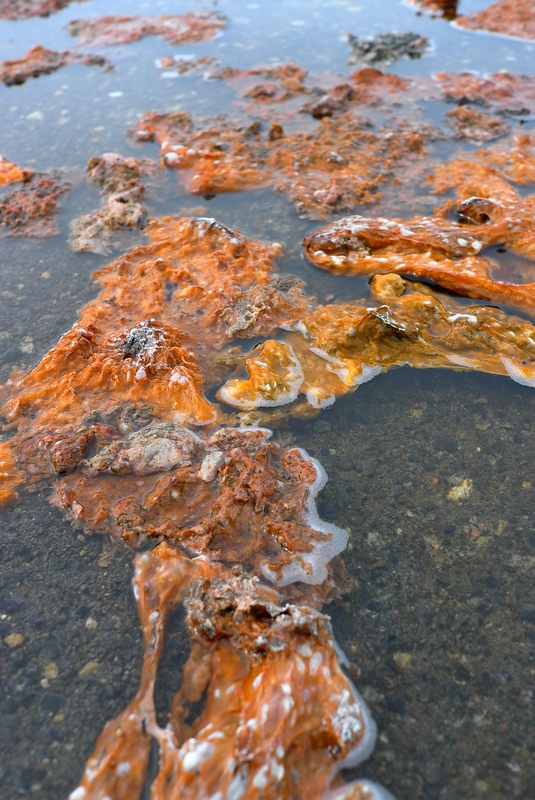 Black and orange growth at the shoreline of a pond reveals underwater bubbles, a sure sign of physiological activity. Many of these streams are currently monitored by researchers in the LTER project, where they examine flow rates, sediment discharge, water chemistry, and composition of the biological communities. While Ruth sampled soils throughout the valley, I’ve been focusing on the water. Water bodies here are unique for many reasons. One of which is that many of them are frozen most of the year. These harsh conditions limit the underwater community to just the hardiest species, and many cyanobacteria excel at just this. With abilities such as withstanding freeze-thaw cycles, these organisms are of particular interest to me. So while I’m here I am collecting water from lakes, ponds, and streams, and when I return to Dartmouth I will analyze these samples, including things like who’s living there, in what abundances, and their potential for toxic metabolite production. Even under the ice, layers upon layers of leafy mats are able to scavenge enough light and thrive. 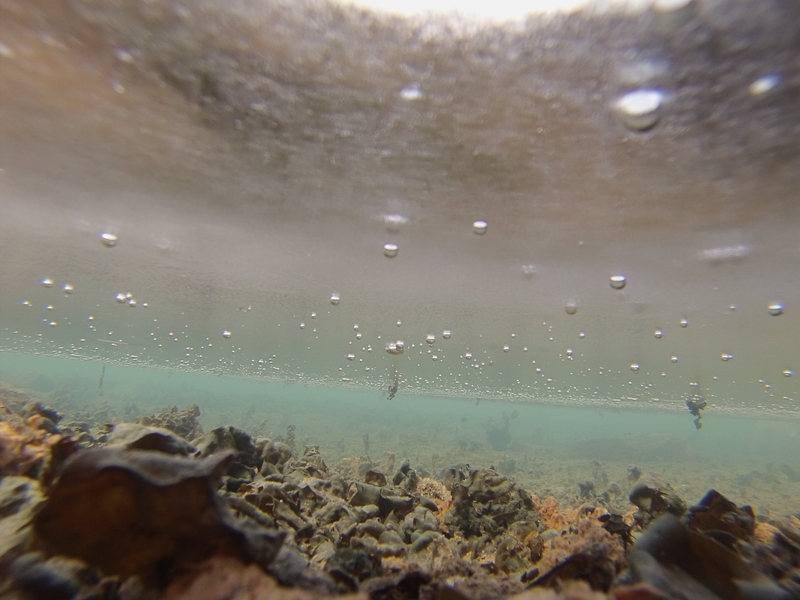 Under the water of a small pond on Hjorth Hill reveals a productive world of algal and microbial mats. 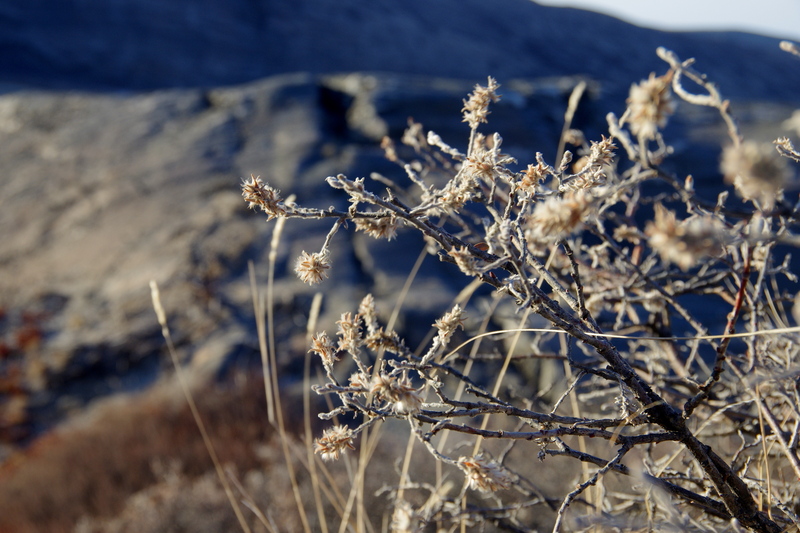 For a frozen desert landscape, it’s incredible how much life persists here. We are back in McMurdo now, but eagerly await our next adventure. Hopefully this week! Until then, thanks for your interest! Although reacquainting myself with the familiar landscape around F6 camp was a great way to spend a few days, exploring new territory is always exhilarating. A few days ago, Jess and I were lucky enough to spend a day on the shoulder of Hjorth Hill – an area I had only explored on maps. Even my colleagues couldn’t give me much guidance – none of them had been there before either. With our maps, GPS, and sampling equipment, Jess and I headed out for an adventure. After landing at Hjorth Hill, Jess is ready to head out on an adventure! Why did I want to explore Hjorth Hill in the first place? I am interested in what controls the amount of phosphorus available to organisms living in soils. Previous work has identified two main possibilities: landscape age (the length of time a soil has been developing) and parent material (the rock type a soil develops from). Hjorth Hill presented the opportunity to test both of these possibilities: two different parent materials of the same age right next to the same parent material of two different ages. My hope was to be able to collect samples of all these soil types, while giving Jess the opportunity to collect water samples. Thankfully, luck was on our side! Landing at Hjorth Hill also gave us a new perspective on familiar territory: the view back into Taylor Valley. Our good luck started with the weather: it was clear enough to fly, but the top of Hjorth Hill was totally socked in (or, as our helicopter pilot put it, “the clouds were a bit dodgy”). This meant that instead of our original plan of landing at the top of the mountain, we had to discuss an alternate landing spot with our pilot. 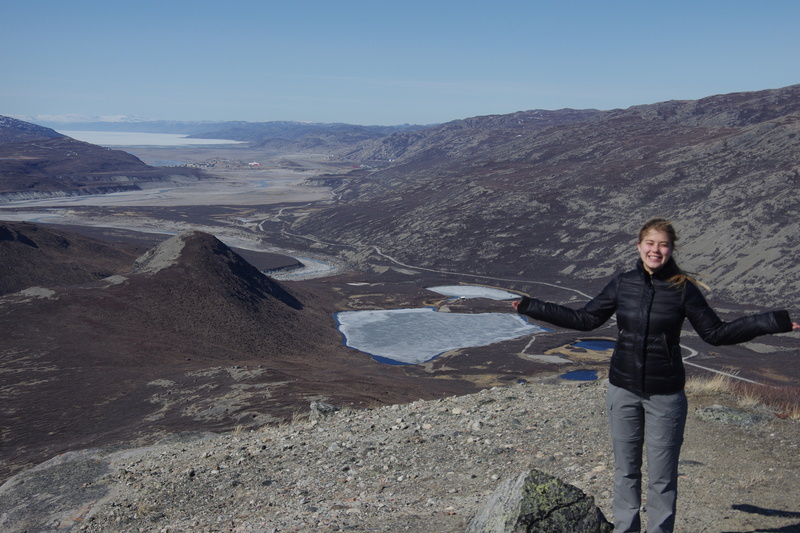 Once Paul learned that Jess was hoping to collect water samples, he chose the perfect location: a flat area on the shoulder of Hjorth Hill right next to numerous small meltwater ponds. Not only that, but all of the ponds hosted thick algae mats in all shapes and colors. Jess was in heaven. The meltwater ponds were incredibly productive, with all sorts of algal mats growing along the shores. 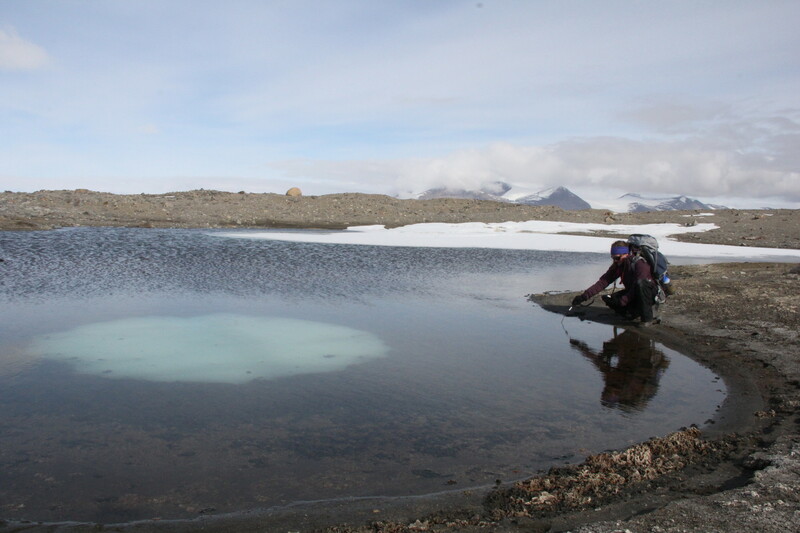 Jess records the water temperature of one of the small meltwater ponds. Ice sits at the bottom of the pond. Landing in unfamiliar territory is disorienting. It’s hard to match what’s on the ground with what is on a map, especially when the terrain is so bumpy. Fortunately, I had marked a few locations on my GPS before heading into the field, so we started hiking toward one of those. 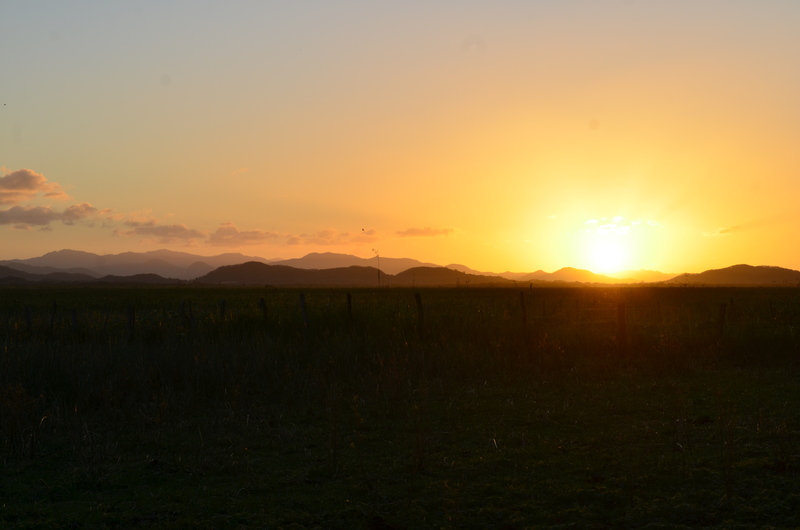 As we began walking, I felt confused – how would we know if we crossed over into another soil type? There didn’t seem to be much to guide us. Suddenly, however, the ground surface changed beneath our feet. Looking back, Jess and I realized that we had crossed over a moraine. We were clearly on a different parent material. Slowly, the pieces started coming together. The ridge separating two noticeably different parent materials. Of course, spending just one day at a site isn’t nearly enough to get to know it. 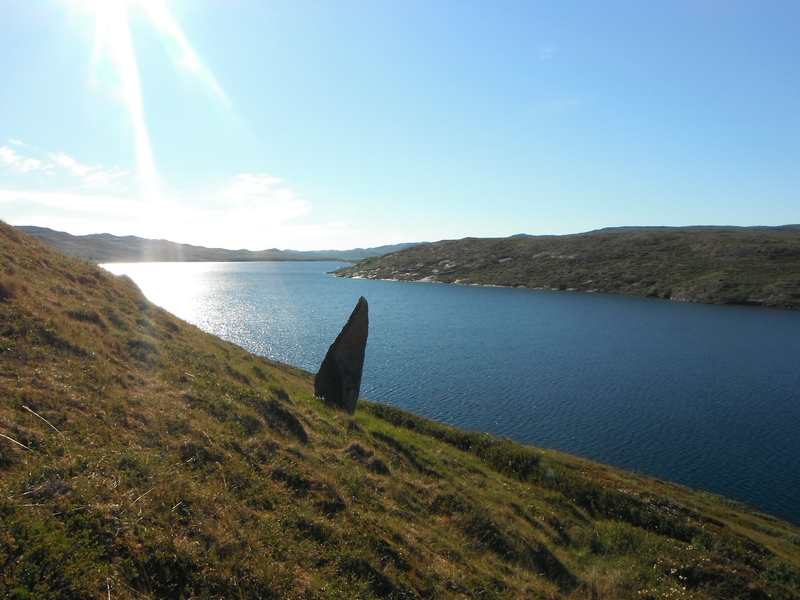 I’d love to return to Hjorth Hill to spend more time exploring. 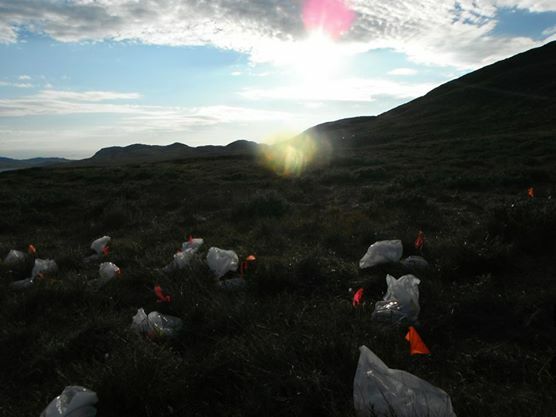 But for now, we’re eager to analyze our samples to learn what Hjorth Hill has to tell us.